Our lowest online rate guaranteed! 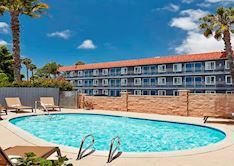 Experience warm hospitality and clean, affordable accommodations in the beautiful Pacific Beach neighborhood of San Diego while being within walking distance of Mission Bay Park. Located with easy access to the I-5 freeway and less than three miles from the breathtaking beaches along the coast, the Red Roof Inn San Diego-Pacific Beach/SeaWorld Area features efficiently designed guestrooms that offer upgraded furnishings with convenient power outlets, mini-refrigerators, microwaves, coffee makers, alarm clocks, hairdryers, free WiFi, writing desks with ergonomic chairs, and flat screen cable TV's - perfect for individuals, couples & family's for leisure or business travel. Wake up every morning to our complimentary deluxe continental breakfast and stay connected in our business center. When you're ready to explore our vibrant city, our San Diego hotel is just minutes from shopping, restaurants, entertainment venues, golf courses and legendary attractions like SeaWorld, San Diego Zoo, and the Pacific Beach Boardwalk and Pier. And, we're a short drive from the San Diego Convention Center and San Diego International Airport. Please note: A valid credit card is required for all reservations. Your credit card will be charged on the day of arrival for the first nights room rate and tax, and your reservation will be immediately canceled if your credit card is declined.